Many employers wage garnishment notices for employees. If this is the first time you received such a notice, here is the information you will need in order to deal with this legal matter. Garnishment is a judicial proceeding in which a creditor or potential creditor asks the court to order a third party to turn over to the creditor property (such as wages or bank accounts) held by that party, in payment of debts to the creditor. For example, the party that wins the judgment in small claims court may ask the Court to garnish the wages of the losing party, to force payment of the amounts owed. A wage garnishment is a specific type of garnishment in which a creditor or government agency (such as the IRS) requires an employer to garnish the wages of an employee. Some instances where wage garnishment is used might be for payment of debts, child support, or unpaid taxes. What is the law regarding garnishment? The federal law regarding garnishment is part of the Consumer Credit Protection Act, which is administered by the Department of Labor. This law protects employees from being discharged by their employer because their wages have been garnished (for one debt) and this law also limits the amount of pay that may be garnished in any one week. States also have garnishment laws which at times may conflict with federal laws, especially in the limits on amounts being garnished. If a state wage garnishment law differs from the federal law, garnish based on the law resulting in the lower amount of earnings being garnished. What's the maximum that can be taken from an employee's pay by garnishment? 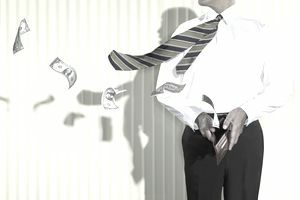 Federal law restricts the amount taken in garnishment to the lesser of 25 percent of an employee's disposable earnings or the amount by which disposable earnings are greater than 30 times the federal minimum hourly wage, whichever is less. A greater amount of an employee's wages to be garnished for child support, bankruptcy, or federal or state tax payments. And an employee can voluntarily agree to have a great amount deducted for payments to a creditor or creditors. What part of an employee's earnings can be garnished? You can consider wages, salaries, commissions, and bonuses as income that can be garnished. Pensions and retirement income may also be garnished. Tips are not considered wages for the purpose of garnishment. See more about disposable income and garnishment, below. Can I terminate an employee whose wages have been garnished? Federal law says you cannot terminate an employee whose wages have been garnished for one debt. But the law does not protect an employee from discharge if the employee's earnings have been subject to garnishment for a second or subsequent debt. What if state law conflicts with federal wage garnishment laws? If a state wage garnishment law differs from Title III, the employer must observe the law resulting in the smaller garnishment or prohibiting the discharge of an employee because his or her earnings have been subject to garnishment for more than one debt. LaToya Irby at The Balance, says, "All states allow wage garnishment for child support and unpaid tax debts. Some states don't allow wage garnishment for creditor debts - North Carolina, Pennsylvania, South Carolina, and Texas." What is Included in disposable income for garnishment purposes? Federal law restricts the amount taken in garnishment based on disposable income, which is the amount left after legally required deductions are made, such as FICA taxes (Social Security and Medicare) and employee share of state unemployment insurance. Deductions not required by law, such as union dues, health insurance, retirement savings contributions (except as required by law) usually can't be subtracted from gross earnings when calculating disposable earnings for garnishment purposes. Can I Be Sued By an Employee for Garnishing Wages? Not if you are acting under court order or order of a federal agency such as the IRS and if your garnishment is within limits set by federal or state law. A recent court case upholds the right of an employer to garnish wages if directed by a legal order. In a 2010 case, an employee sued his employer because the employer would not stop a tax garnishment or reduce the amount. The employee lost his case, and the appeals court upheld the decision. [Bullock v. Bimbo Bakeries USA Inc. No. 10-2376, 3rd Cir.]. In general, it's important to remember that you (as an employer) must follow the law and you must garnish employee wages when you receive a notification. Disclaimer: The information in this article is intended to be general in nature, and is not intended to be tax or legal advice. Laws and regulations change, and each situation is unique; be sure to check with an attorney if you have further questions about wage garnishment.